Senior guard Kaleigh Hughes stops and pops a 3-point shot during Bradley Central's 59-45 victory over Creekview (Georgia) Friday in the opening game of the Holiday Inn Express Thanksgiving tournament at Jim Smiddy Arena. Hughes finished with 16 points that included four 3-pointers. CLEVELAND, Tenn. – Senior Kaleigh Hughes’ offensive production through the season’s first two games was, quite honestly, lacking. In games against Baylor and William Blount, Hughes made a combined 1 of 10 3-point attempts and scored seven total points, her season average in 2017-18 when the 5-foot-8 guard shot 36 percent behind the arc. “I was getting a little worried,” Hughes said Friday. Well, Hughes’ mind is more at ease after hitting 4 of 6 3-pointers and scoring a team-high 16 points in Bradley Central’s 59-45 victory over Creekview (Georgia) in the opening game of the 19th Holiday Inn Express Thanksgiving tournament in Jim Smiddy Arena. Hughes only had to wait 23 seconds to find her long-distance range against Creekview for the game’s first points. She drained another 3 with less than a minute left in the first quarter. In the second period, Hughes drained back-to-back 3s and dropped in a layup to push Bradley’s lead to 24-11. 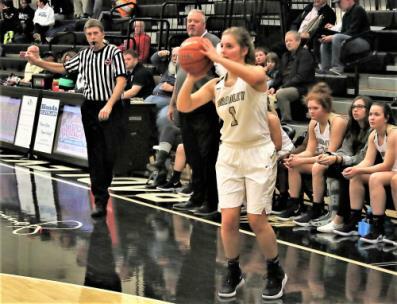 Hughes started the third quarter with her fourth 3 and capped her 16-point effort with a field goal that gave the Bearettes (3-0) a 44-23 advantage. The Bearettes hit 9 of 22 shots behind the 3-point line and junior guard Cambree Mayo connected three times and finished with 11 points. Sophomore guard Jamaryn Blair also had 11 points, made one 3 and grabbed a team-high 8 rebounds despite her 5-6 stature. Anna Roberts knocked down the Bearettes’ other 3-pointer. The Bearettes, who have won 100 of their last 106 games, are going for their fourth straight tournament HIE Thanksgiving championship and seventh overall. Wilson Central is a five-time tourney winner. Bradley Central advanced to the winners’ bracket semifinals on Saturday at 10 a.m. and will face Daniel Boone (2-0). The Trailblazers defeated the Grace Christian Lady Rams, 55-49, in the day’s second game. McMinn Central (3-1) and Sullivan Central (3-0) play in the other semifinal game at 11:30 a.m. The Lady Chargers beat Eagle’s Landing, 60-46, as Melia Baker scored 21 points on 9 of 14 shooting. The Lady Cougars defeated Collierville, 50-36, behind Abbey Crawford’s 15 points and 12 rebounds. In last season’s tournament, Bradley beat Daniel Boone, 56-53, and also knocked off the Trailblazers, 56-27, in the Class 3A state tourney quarterfinals. 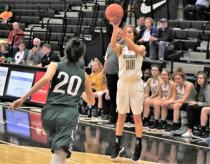 In 2016-17, the Bearettes defeated Daniel Boone, 61-42, in the Andrew Johnson Bank Ladies Classic in Greeneville, Tennessee. Reuter referred to the Bearettes uncharacteristically not reaching a couple team goals against Creekview, located in Canton, Georgia. The Lady Grizzlies manhandled the Bearettes, 28-16, in the paint, primarily because senior post Josie Johnson scored a game-high 24 points on 9 of 15 shooting and also pulled down 13 rebounds. Additionally, Bradley committed 14 turnovers, two above their targeted goal. Blair (4) and Anna Walker (3) combined for half the turnovers. Bradley limited the damage of their own miscues by outscoring the Lady Grizzlies 22-6 off turnovers. “It was a combination of things,” Reuter said, “We won by 14, but let one girl score 24 points and that hasn’t happened in quite a while. And she got 13 rebounds. 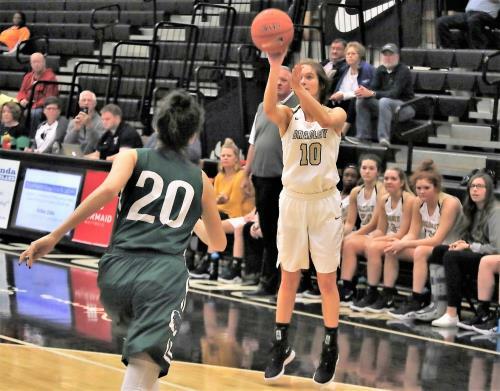 The Bearettes had a three-plus minute scoring drought in the first quarter and a four-plus minute dry spell in the fourth period with primarily reserve players on the court. Bradley, which stretched its regular season winning streak to 71 games – the Bearettes’ last loss was a 56-55 setback at Cumberland County on Jan. 5, 2016 – had a 53-31 lead after three quarters, but slowed the tempo considerably and managed to score just six points. Creekview (45) – Fitzgerald 1, Wilkie 2, Waters 6, Mason 2, Josie Johnson 24, Burke 2, Craft 3, Pridemore 5, Salas, Pearce. Bradley Central (59) – Kaleigh Hughes, 16, Roberts 5, Jamaryn Blair 11, Walker 8, Lombard 4, Reuter, Williams, Mayo 11, Barnes 4. 3-Point Goals – Creekview none, Bradley Central 9 (Hughes 4, Mayo 3, Roberts 1, Blair 1). Daniel Boone (55) – Madi Runnels 13, Gibson 2, Jaycie Jenkins 14, Bayleigh Carmichael 13, Clark 8, Carroll, Casey, Dietz, Stevens 5. Grace Christian (49) – Cassie Peters 18, Chloe Duggins 13, Hammond, Carter 7, Campbell, Barfield 8, Stewart, McReynolds, Hawkins. 3-Point Goals – Daniel Boone none, Grace Christian 6 (Peters 3, Duggins 2, Carter 1). Eagle’s Landing (46) – Weronkia Hipp 19, Queen 3, Beard, Barnett, India Bellamy 18, B. Bellamy 6, Herman, Bracy. McMinn Central (60) – Carlie Runyan 13, K. Baker, Melia Baker 21, Anika Smith 9, Beaty 4, Rule 2, Crabtree 5, Buckner 6. 3-Point Goals – Eagle’s Landing 4 (Hipp 4), McMinn Central 1 (Smith 1). Collierville (36) – Mallorie Taylor 10, Farrell-Rousseau 2, Rodgers 9, D. Amaefula 9, Robinson 3, M. Amaefula, Brown, Pham 3. Sullivan Central (50) – Sams 7, Robinette 4, Leming 5, Hurd 2, Abbey Crawford 15, Lambert 4, Horne, Macy McClellan 13. 3-Point Goals – Collierville 2 (Taylor 1, D. Amaefula 1), Sullivan Central 4 (McClellan 2, Sams 1, Leming 1). Grace Christian (28) – Duggins 3, Hammond 4, Peters 2, Carter 3, Campbell 1, McReynolds 6, Barfield 3, Forrester 3, Ellison 3, Hawkins, Stewart, Hack. Creekview (61) – Fitzgerald 6, Emily Wilkie 14, Pridemore 5, Josie Johnson 14, Craft 4, Mson 2, Burke 4, Pearce 4, Salas 4. 3-Point Goals – Grace Christian 4 (Duggins 1, Carter 1, Forrester 1, Ellison 1), Creekview 2 (Pridemore 1, Craft 1). Collierville (74) – Taylor 9, Anandi Farrell-Rousseau 19, Rodgers 9, Destiny Amaefula 21, Robinson, Pham 6, Brown 3, Hurlbut, Barger 5, Jones, Gary, M. Amaefula 2. Eagle’s Landing (49) – Weronkia Hipp 13, Queen 6, Beard, Barnett 2, India Bellamy 18, Bria Bellamy 10, Herman, Bracy, Daniels. 3-Point Goals – Collierville 7 (D. Amaefula 3, Taylor 2, Rodgers 1, Pham 1), Eagle’s Landing 3 (Hipp 3). Bradley Central's get off a shot before Creekview's Savannah Burke can contest the two-point attempt in the Bearettes' 59-45 win over the Lady Grizzlies on Friday. The game opened the 19th Holiday Inn Express Thanksgiving tournament at Bradley Central High School. The tournament continues Saturday.